August 7, 2014…Nobody wants to see an August swarm. Yet here it is. There was little doubt about where the swarm originated from. It was parked in the plum tree behind Bee-atrice Log hive. I just didn’t want to believe it was from Bee-atrice. I had such high hopes for her. The swarm that found her has been there for only two months to the day. It was a big swarm that day on June 7th. I had never seen bees build so fast as you can see by the pictures. 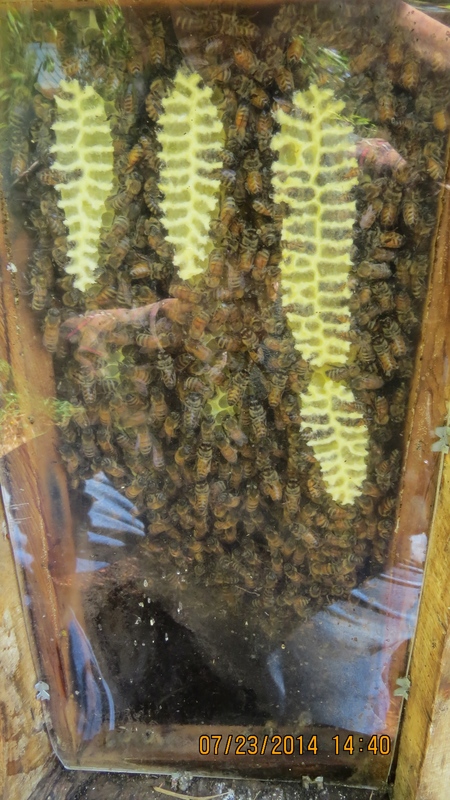 July 9, 2014…After only one month the comb has been built where it’s becoming visible in the observation window. These bees are serious. July 14, 2014…Comb is already touching the window. The mouth entrance is seen at the lower middle. July 18, 2014…Three combs are inching their way down the window. 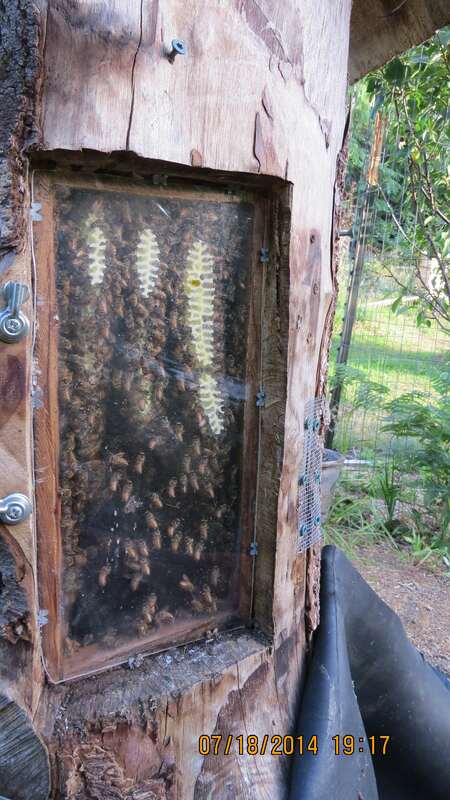 July 23, 2014…The observation window is filled with bees and comb. 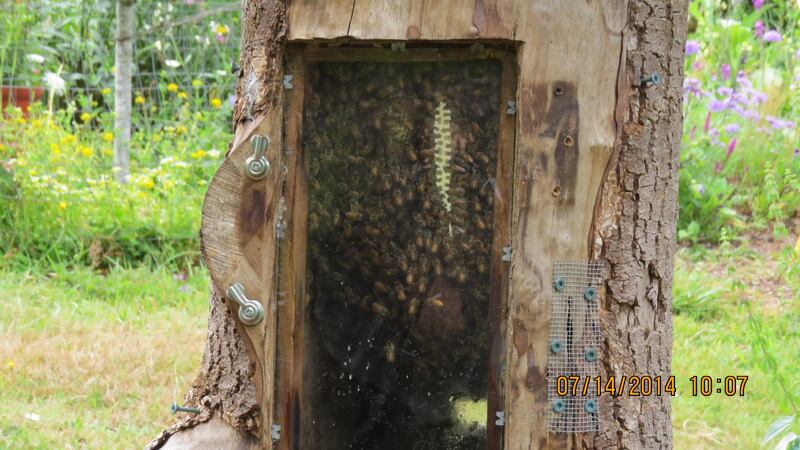 July 23, 2014…Bee-atrice’s bees have settled in nicely. 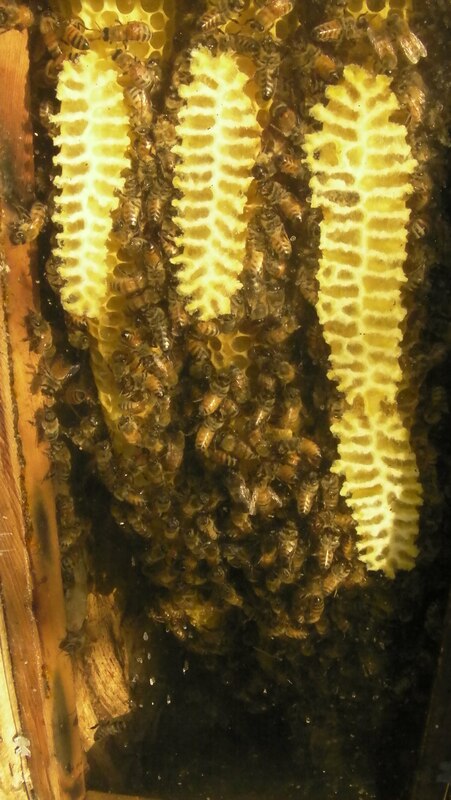 This picture shows the bees and naturally built comb…no pink plastic foundation here! I was just getting ready to shoot some videos of Bee-atrice’s two month anniversary over the weekend. We were sitting at the dinner table when my wife wondered aloud about that brown spot in the plum tree. 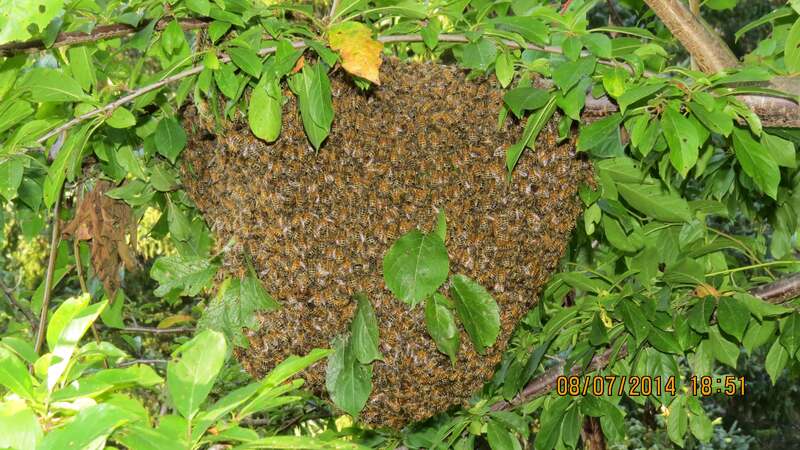 I was hoping it was our eyes playing tricks on us, but noooooo, it was the real deal…an August swarm. 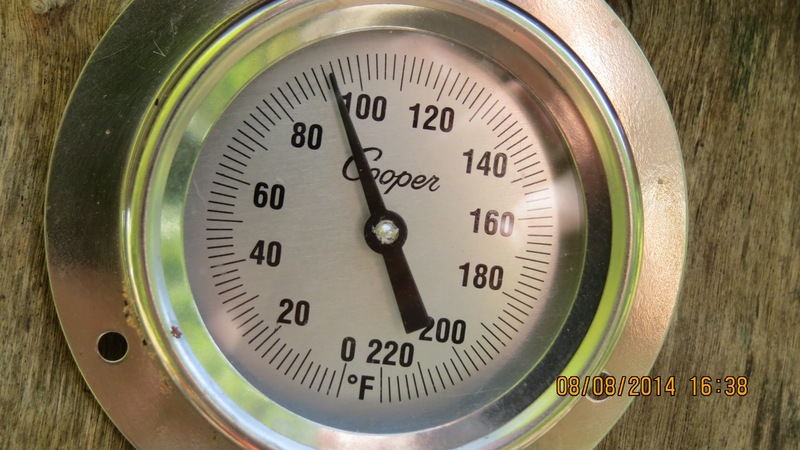 August 8, 2014…After Bee-atrice swarmed, brood temperature is holding steady. 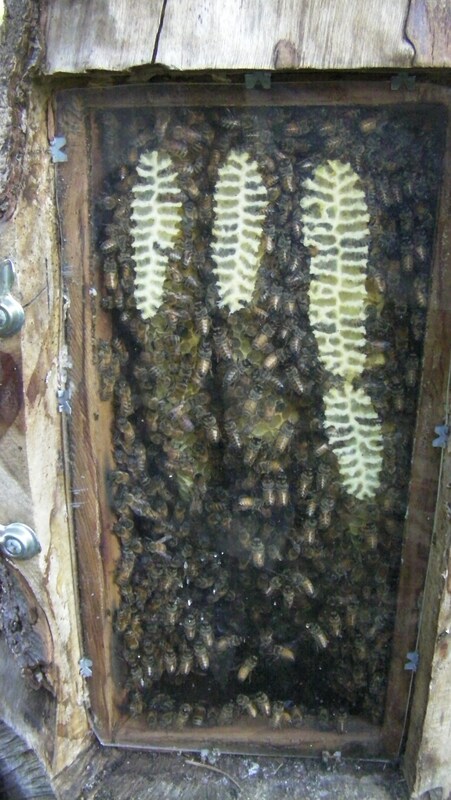 August 10, 2014…A look through the observation window shows many fewer bees after the big swarm left..
Now we wait and worry for the emerging virgin queen to come back alive and inherit the hive…fingers crossed. I love those observation photos! I don’t know how, but somehow I failed to clock the observation part of the log hive. Sorry about the swarm. 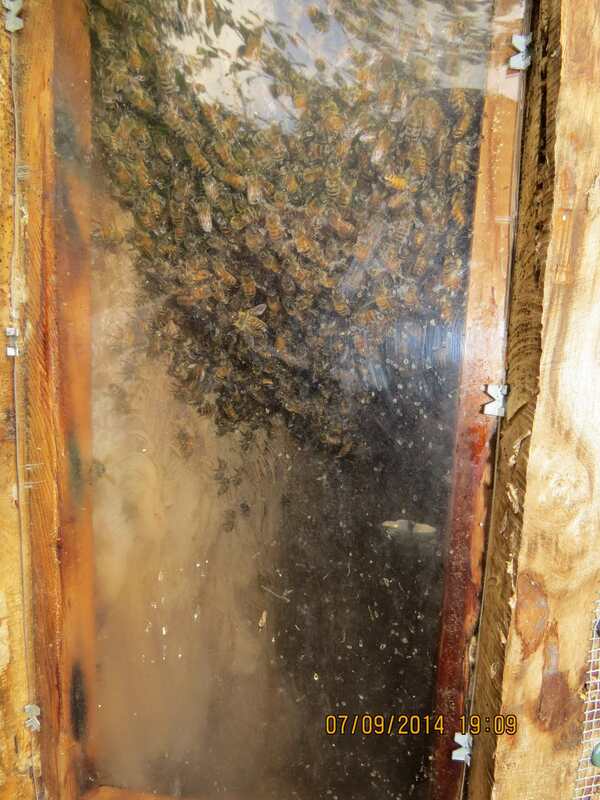 Surely it’s a strong enough hive to survive the hit….